The user can choose to convert Advance Steel-generated details drawings to .DWG format by exploding either a single drawing (“Explode details” command), or a set of drawings (“Explode drawings” command), whilst having the advantage of obtaining AutoCAD dimension lines, which can be further edited and controlled in an easy manner. For a single drawing, use the “Explode details” command and click on the Explode button in the dialog window. Choose where to save the exploded details drawing and click OK.
After performing the exploding, the command automatically closes the Advance Steel drawing and opens the exploded one. Similarly, for a set of generated details drawings, open the Advance Steel model and use the “Explode drawings” command. Select the desired registered drawings, click on the Explode button in the dialog window, choose where to save the exploded .DWG files and finally click OK. The command opens each Advance Steel drawing, performs the exploding and then automatically closes it. Users may find here below certain limitations of the “Explode” commands. By becoming aware of them, they can apply this powerful tool without performing a thorough check of every exploded detail. In order to ensure that, and for enhanced user control of the resulting exploded drawings, the 2019 version introduces warning messages both inside the dialog windows and in the exploded details drawings. These messages signal that the commands might generate incorrect or unexpected results in some particular cases, due to development limitations. 1. 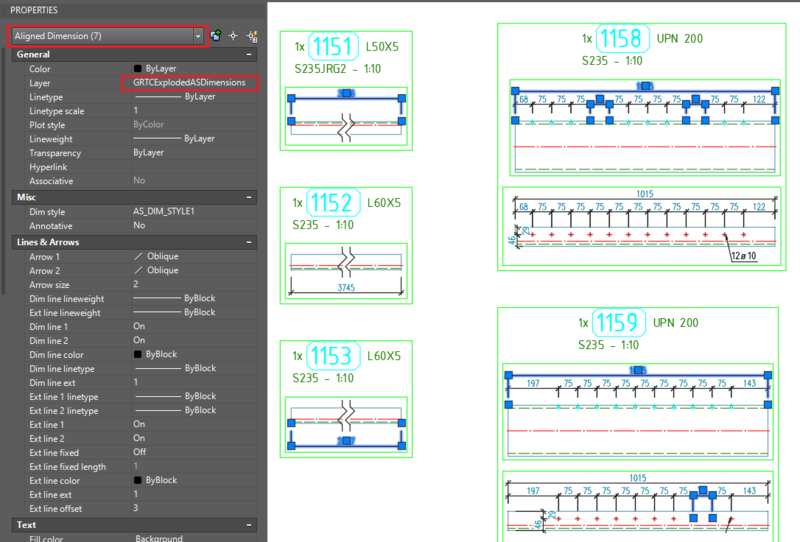 For details that contain “clipped” elements, some of the values of dimensions that are part of a dimension chain might not be correct. For the moment being, the workaround would be to disable, wherever possible, the “Clipped” option or to manually change the value for the dimensions signaled as incorrect, at least in drawings that contain a relatively small number of details and when this process is not cumbersome. 2. 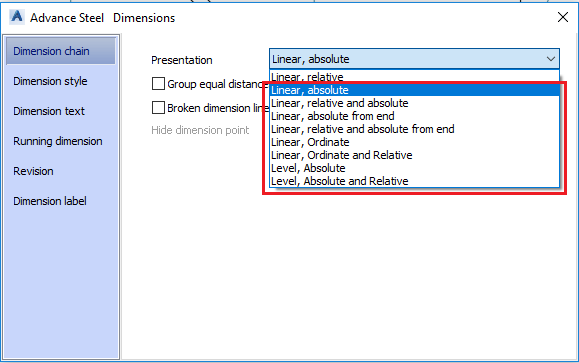 For dimensions which are not “linear, relative”: since there is no clear, one-to-one equivalent between the dimension types available in Advance Steel and those available in AutoCAD, the commands are not able to generate entirely correct results. Also, they do not maintain the presentation type of dimensions when exploded and may sometimes even convert them into plain lines and text (see example below). 3. Currently, for the “Explode” commands to work correctly, the detail drawings with dimensions created in other units than mm must be located in the original “Details” folder, linked to the model file.